We are on the cusp of one of the best political years in modern political history in the Heart of Dixie. Prior to the 1970s, our constitution disallowed succession of office for our state constitutional offices. In other words, you could not run for two consecutive four-year terms. That is why George Wallace ran his wife in his place in 1966. George and Lurleen campaigned side-by-side. By the way, she won in a landslide. She beat eight male opponents without a runoff, including two former governors, an agriculture commissioner, the sitting state attorney general and two powerful state senators. However, you could serve a four-year term and wait out four years and run for a second term. Only two men had done that in Alabama history. Prior to the constitutional change in the 1970s, Bibb Graves of Montgomery had done it early in the century and Big Jim Folsom did it in 1946 and again in 1954. Now that governors can succeed themselves, it has become common practice for governors to serve eight years rather than four. Thus, the 2018 governor’s race will be a once in an eight-year opportunity. Folks, we are in for one heck of a year and the bell rings June 6. Therefore, the horses will begin lining up over the next few months. It will be a great cavalcade of characters. The early favorite horse in the 2018 Derby is Roy Moore. The Chief Justice’s expulsion from the bench by the Judicial Inquiry Commission has propelled him to stratospheric levels in polling. Leading a horserace is a good analogy for Moore since he traditionally rides his horse to vote at his polling place in Gallant in rural Etowah County. Some of you may question Moore’s popularity, but the numbers are there in every poll. The JIC has made him a martyr. Alabama is a very religious state and being thrown out of office by an unaccountable commission for being against homosexual marriages is a pretty good issue to run on in the Bible Belt. Roy Moore is the wild card in the early 2018 jockeying. Most folks have him in the governor’s race. However, he has two other options. Attorney general or the U.S. Senate seat. He would probably win either of these posts. The governor’s office is another question. Historically, people do not think of him as governor. He lost miserably both times he ran, whereas he wins handily for a state judgeship. His best race is for attorney general or U.S. Senate. Twinkle Andress Cavanaugh has a free shot in 2018. She was just re-elected to a four-year term as Public Service Commission President. She is already out running for governor and sometimes the early bird gets the worm. State Agriculture Commissioner John McMillan is term-limited in that job that he has done well for eight years. He is well liked by everyone who knows him and is planning to run for governor. 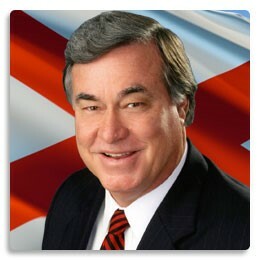 Young Boozer has also served his two-term eight-year limit as State Treasurer. He is a wild card and gives no hints as to what his future political plans are for 2018. Young is not a natural politician. He is an erudite Stanford-educated successful banker who was perfectly suited for the State Treasurer’s post and he has done an excellent job. Secretary of State John Merrill is probably the best retail politician in the state at this time. Lots of people have encouraged him to run. However, he is one of the few constitutional officeholders who can run for re-election in 2018. He will probably bide his time and run for re-election. State Senate President Pro Tem Del Marsh of Anniston is itching to pull the trigger on the governor’s race, but being a powerful state senator does not translate into statewide name identification. However, Marsh is said to be wealthy. If he were to spend $3 to $5 million of his own money, he could be a player. The very popular mayor of Huntsville, Tommy Battle, is seriously considering the race. If he joins the fray he could be a player. He would come out of the Tennessee Valley with a strong start. There are a lot of votes in North Alabama. We are in for a heck of a campaign year. I will keep you posted.